It’s been quite awhile since the last newsletter went out. That being a product of so much going on everywhere on so many levels from the personal to the international. What a crazy year. It’s hard to keep up and stay on top of things. But stay on top we will. What better time to be nurturing creativity and artistic expression with the hope of spreading a little light into the world. What better job could one have. Speaking of staying on top of things, if you are thinking of taking a class this summer or encouraging others to do so now is the time. Classes are filling fast and we’re gearing up for another fantastic summer program. 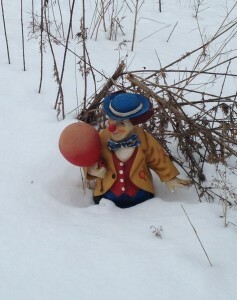 Our Clown-Greeter loves the winter, but can’t wait for the summer! We are offering the full range of classes including "Baby Clown: The Teacher’s Perspective”. I have not included that one on the poster but the dates are June 17-23 and are posted on the website. The Conservatory is growing and we had a superb summer last year with a record number of Mask and Clown Intensive students coming from across Canada, Europe, the U.S., and New Zealand. We also did our first public presentations with the advanced classes and a couple of workshop presentations and readings of professional work that had been in part developed at the Conservatory. Speaking of which if you are in Calgary or nearby you might want to catch Mump & Smoot in Anything at Albert Theatre Projects as part of the superb High Performance Rodeo. That runs until Feb 1. Also coming up are Jed Tomlinson and Jacqueline Russell in The Sama Kutra, directed by Michael Kennard. That’s also coming up in Calgary. Visit Brown Paper Tickets for information and tickets. And if you’re in Montreal don’t miss Sandrine Lafond’s Little Lady's Meanders, directed by Miriam Cusson and John Turner. Visit Danse-Cité for tickets and more. We hope to see you somewhere soon.